Part of Flushing. 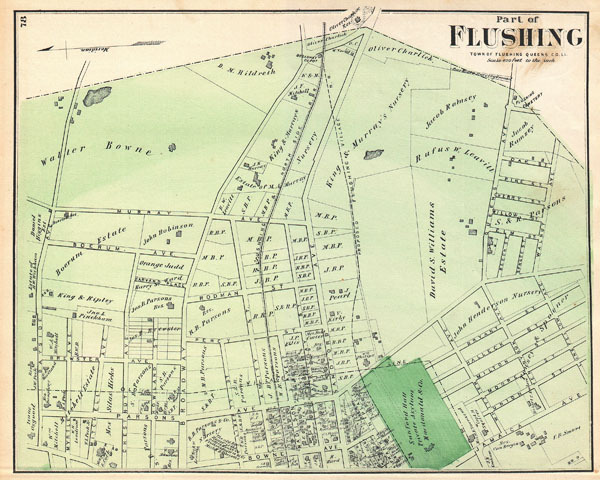 Town of Flushing, Queens Co.
A scarce example of Fredrick W. Beers' map parts of Flushing, Queens, New York City. Published in 1873. Oriented to the east. Roughly covers from Bayside Avenue south to Walnut Avenue. Includes Sanford Hall, the Private Asylum. Detailed to the level of individual properties and buildings with land owners noted. This is probably the finest atlas map of this part of Queens, New York, to appear in the 19th century. Prepared by Beers, Comstock & Cline out of their office at 36 Vesey Street, New York City, for inclusion in the first published atlas of Long Island, the 1873 issue of Atlas of Long Island, New York. Very good condition. Blank on verso. A few minor verso repairs including repair extending up to four inches from right margin. New York Public Library, Map Division, 1527294.